Lone mothers have often been described from a deficit perspective as women who lack a partner, an additional income provider, and a co-parent. Newer research has focused more on the agency and coping competencies of lone mothers, showing that most deal with their lone motherhood quite well, receiving support from family and friends. However, we still know little about the actual networks of personal relations lone mothers are embedded in: What is the structure and composition of these networks, and how is social network integration related to individual well-being? To address these questions, in this research we a) focus on an especially vulnerable group of lone parents, i.e., single mothers who are long-term unemployed; and b) use a mixed-methods design in order to analyze systematically their network structures, and to perform an in-depth investigation of how their social contacts relate to their well-being. We conducted qualitative problem-centered interviews and collected structured network data on a sample of 26 unemployed lone mothers from eastern Germany. The interview data were analyzed using the strategy of qualitative content analysis, while the social network data were studied by means of social network analysis. The results from both analyses were brought together to develop a network typology. Our findings show that even mothers in the vulnerable group of women who had no partner and were unemployed could not be described as fully socially isolated. The variation in the extent of their social contacts was, however, large, ranging from women with large and heterogeneous networks that provided them with considerable support and contributed substantially to their well-being, to women with very small networks who had little access to support and a very challenging living situation. A typology of networks distinguished between four network types according to their composition: networks dominated by the family of origin, networks centered on a conjugal relationship, extended networks, and restricted networks. These networks had interesting associations with well-being: first, the network composition was not only a precondition for the provision of support, but was also a consequence of the strains the respondents were under; second, the social network types identified fostered well-being to differing degrees. In terms of the structural features, we find that networks that included the woman’s own or her partner’s mother and/or sisters, and heterogeneous relations, were associated with well-being; as were networks of large or medium size and of high multiplexity. However, purely relying on these structural features is not sufficient. Not the pure existence of supportive network matters, but also their meaning to the respondent: only if the ties are not perceived as conflictual and if the support provided is evaluated as adequate, these ties can foster well-being. In Germany as in many other western countries, lone parenthood is a common family form: a single parent heads every fifth family with children under age 18 (BMAS 2013: 5). There are, however, considerable differences between western and eastern Germany: in 2009, 17% of families in western Germany were headed by a lone parent, compared to 27% in eastern Germany (Lois and Kopp 2011). Around 90% of lone parent families are headed by a mother (BMAS 2013: 5), and most research on lone parents is on lone mothers. 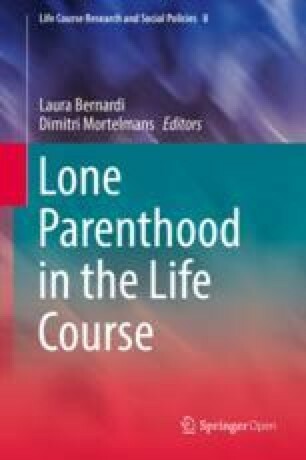 Lone parent families are a very heterogeneous group in terms of their socioeconomic characteristics, their path into lone parenthood, and the ways they perceive and cope with lone parenthood. Regardless of these differences, all lone parents face competing pressures of holding down a job while caring for their children. Because combining family life and work is challenging, especially without the support of a partner, lone parents are often unemployed. Currently in Germany, 40% of lone parent households are receiving transfer payments for the unemployed (“Grundsicherung für Arbeitssuchende”) (BMAS 2013: 5), and about half of them have been receiving these payments for more than 4 years (Achatz et al. 2013: 12). Compared to couple families, lone parent families are more likely to live in poverty, and to report having high levels of stress and low levels of well-being (BMAS 2013). Lone parents and the long-term-unemployed are often designated as vulnerable groups. The concept of vulnerability describes a zone in which the risk of social downward mobility and poverty is high, and an individual’s abilities and resources to cope with these social risks are limited (Vogel 2006). When a woman who is a lone parent and/or is long-term unemployed is faced with critical life events, chronic stresses, or environmental hazards, her resources are often not sufficient to buffer the strains; thus, she becomes increasingly vulnerable (Hanappi et al. 2015), and her disadvantages accumulate. In recent decades, research on social support has shown that having supportive personal relationships can ease or even help individuals overcome situations of poverty, unemployment, or stress; and can contribute to well-being (Cobb 1976; Henly et al. 2005; Lin et al. 1999;). A number of studies have shown that social support benefits single parents in particular (Ciabattari 2007; Cook 2012; Harknett 2006). While social support research has mainly focused on the perception and the reception of different types of support, social network research takes a more differentiated view by looking at the meaning and the effects of social relations, and the structural properties of the networks they form (Smith and Christakis 2008). This structural perspective examines the structural characteristics of the network (such as size, density, and composition) and the social mechanisms beyond those of social support (for an overview, see Berkman and Glass 2000), and analyzes social relations and network structures separately from the mechanisms through which social relations affect individual behavior and well-being. Thus, this perspective enables us to determine which types of ties are supportive in which ways, as well as how the overall network structure influences the perception and the reception of support. Little is currently known about the interplay of social network structures and social support in creating well-being or in enabling people to escape poverty. To help fill this gap, we focus in this article on long-term unemployed lone mothers who have experienced two critical events—namely, separation from a partner and the loss of employment—and who could therefore be perceived as being especially vulnerable. Studies on lone parents and on the effects of unemployment have often postulated that the critical events of separation or job loss lead to social isolation, or at least to a reduction in social contacts. It is therefore assumed that a woman who is separated or unemployed loses certain ties, such as ties to her ex-husband, his relatives and friends, or her former colleagues. Additionally, people who lose a partner or a job also lose important sources of social approval (e.g., Castel 2000; Myers et al.1975). However, only a few existing studies have focused in detail on the personal relationships of members of these vulnerable groups, analyzing the social networks they form, the structure of these networks, their interactions, and how they are perceived. These studies have examined not only what these individuals have lost, but also how their lives have changed, and how they have actively built their social networks according to their preferences and needs. The results of this research indicate that people who are unemployed or lone parents have a large variety of networks that differ in terms of structure and composition, but that they are rarely fully isolated individuals. Additionally, these studies have found that individuals who have lost certain ties tend to compensate for these losses by building new ties or intensifying existing ones (e.g., Marquardsen 2012 for unemployed persons; Niepel 1994 for lone mothers). In order to provide a more detailed picture of the social relations of unemployed lone mothers, we present in this chapter an explorative study in which we examine how the networks of unemployed lone mothers are structured and composed (e.g., whether these women can be described as socially isolated), identify different types of networks, and analyze which types of networks are or are not supportive and conducive to the well-being of women in vulnerable situations. As our main interest is in measuring the quality of life of unemployed lone parents, we focus on their subjective well-being. Researchers have not agreed on a clear-cut definition of the concept of well-being; a number of scholars have alternatively employed concepts such as happiness or life satisfaction, and have sometimes even used these terms interchangeably (e.g., Ferrer-i-Carbonell 2005, Kohler et al 2005; Myrskylä and Margolis 2014). However, many researchers, especially those in the socio-psychological tradition, have characterized subjective well-being as a broad concept that encompasses emotional elements (positive and negative emotions, such as joy, shame, happiness, depression, contentment, anxiety, affection, and stress) and cognitive elements of life satisfaction in general, and of satisfaction in different domains (e.g., work, family, leisure, health, or finances). Scholars have also described subjective well-being as a concept that encompasses past experiences, future expectations, and the views of significant others (Diener 2007; Heidl et al. 2012; Kim-Prieto et al. 2005; Glatzer 1992). The effects of social engagement and social relations on subjective well-being are frequently stressed (e.g., Cummins 1996; Diener and Seligman 2002, Helliwell and Putnam 2004). In our research on unemployed lone mothers’ subjective well-being, we take the perspective of social network analysis. The social network perspective not only stresses the relevance of the existence of ties and the support they provide, but also considers the structure of the social relationships the individual is embedded in. The properties of the network partners (alteri), as well as the properties of the network structure, enable or constrain an individual’s (ego) behavior (Burt, 1982; Degenne and Forsé, 1999). How social support affects an individual’s well-being depends on the structure of the network and on the network partners’ resources. The concept of social support refers to various kinds of perceived and received support, with distinctions often being made between emotional support (providing affection, respect, and advice), social companionship (forms of socializing, such as meeting and going out), instrumental support (helping with chores or child care), and information (e.g., providing information about job opportunities, Granovetter 1973) (cf. Diewald 1991; Hirsch 1980; Wellman and Wortley 1989). In particular, emotional support and social companionship foster the affectual aspects of individual well-being (by, for example, reinforcing identity and recognition; as Lin 2001 explained), while instrumental and informational support pertain more to the cognitive aspects of life satisfaction. From a network perspective, the overall level of support and the specific types of support available to individuals vary. The types of alters who provide support, and the resources these alters have available also vary (Wellman and Wortley 1989). In addition, network characteristics differ depending on the ego’s social position (e.g., socioeconomic status, marital status, number and age of children). These differences can make it difficult to compare the results of different groups (McLanahan et al.1981; Acock and Hurlbert 1990, 1993). Of the many network characteristics that could be analyzed, I will present here four of the characteristics that are most commonly used in research: network size, composition, density, and multiplexity. The size of the support network measures the number of individuals who provide support, while the composition of the network refers to the characteristics of the network partners, including their role in relation to the respondent. Research on the associations between network size, support, and well-being does not show consistent results: on the one hand large networks are associated with happiness and well-being, regardless of the exchange content (Gerstel et al. 1985); while on the other mothers in smaller networks tend to receive more support than those in larger networks, and to evaluate the support in a more positive way (Malo 1994). Research on network composition has shown that having a variety of types of relationships—that is, having a heterogeneous network—increases self-esteem, and may therefore improve well-being and access to instrumental resources (Acock and Hurlbert 1990). Networks that include a partner, relatives, and friends or neighbors significantly contribute to life satisfaction (Deindl 2005). Other relevant network measures are the density and the multiplexity of ties. Density measures the degree to which network partners interact with each other. Multiplexity is a quality of the relationships in the network: multiplex relationships provide various forms of support, while uniplex relationships only provide one type of support. In general, it is assumed that dense and multiplex networks are positively associated with providing services and emotional support, while loose-knit networks are positively associated with providing access to information and to new social contacts (Mitchell 1969; Granovetter 1973). However, research has also shown that this might not be the case for lone mothers, because they may see support from relatives, usually within a dense network, as less satisfying than support from friends within a sparse network (McLanahan et al. 1981); and because less dense networks may provide more flexible support, and are therefore better at providing the support needed when adapting to a new situation (Gerstel et al. 1985). Social support cannot be demanded or granted arbitrarily; rather, these exchanges follow specific culturally defined rules and practices that define the expectations, obligations, and rights of the individuals involved (McCallister and Fischer 1978). One concept that is relevant in this context is reciprocity. According to social equity theory, individuals in inequitable relationships will try to restore equity by providing support to their supporters (Walster et al. 1978; Plickert et al. 2007). However, there are also role relations with rather one-sided exchanges; e.g., parents supporting their (young) children. If we take into account the role of cultural norms and values in social interactions, we can assume that if there are regional differences in these norms, we will also find regional differences in the associations between networks, support, and well-being. Support affects individual behavior and well-being through two mechanisms: 1) the direct effect of social support that enhances personal well-being in general, irrespective of the stress level; and 2) the buffering effect of social support in the presence of a stressful event (Cohen and Syme 1985). In our research, the respondents had experienced at least two potentially stressful events: separation from a partner and unemployment. Personal relationships are not, however, necessarily supportive or conducive to well-being, as they can also restrict behavior, have negative consequences, and be sources of conflict (Abbey et al. 2010; Attree 2005; Gräbe 1991; Acock and Hurlbert 1990; Laireiter et al. 2007). Little is known about the interplay between support and conflict. Recent research has shown that among respondents who reported having a high level of social support social conflicts were uncorrelated with their well-being, while among respondents who reported having a low level of support social conflicts had a negative impact on their well-being (Abbey et al. 2010). Research on subjective well-being and happiness has shown across countries that parents who are in a partnership have higher levels of well-being than single parents, irrespective of the specific definition of well-being (BMFSFJ 2012; Helfferich et al. 2003; Kohler et al. 2005; Osborne et al. 2012; Vignoli et al. 2014; Winkelmann and Winkelmann 1998). But what are the mechanisms that underlie the correlations between having a partner and well-being? The low levels of well-being observed among lone mothers are often attributed to the lack of a stable partnership, the stress and responsibility associated with childrearing, and the difficulties associated with finding employment. While research on partnerships has clearly shown that all people who are in a partnership (irrespective of their parity) have higher levels of well-being than people who are single (Kohler et al. 2005), and research on unemployment has shown that people who are unemployed have lower levels of well-being than people who are employed (Clark and Oswald 1994, Winkelmann and Winkelmann 1998), research on the correlation between having children and well-being has generated mixed results (Kohler et al. 2005; Myrskylä and Margolis 2014). If we look at lone parents specifically, it appears that their relatively weak socioeconomic position largely explains their lower levels of well-being (Vignoli et al. 2014). Many studies use cross-sectional data, which cannot address causal relationships. Do lone parents report lower levels of well-being than parents in partnerships because of the hardships of lone parenthood, or are people who are in general less satisfied with their life also at higher risk of becoming a single parent or unemployed? The longitudinal data that would be needed to address these questions are sparse. One study on lone mothers in Poland that controlled for selection effects found that the birth of a non-marital child does not decrease women’s well-being, and may have the opposite effect (Baranowska-Rataj et al. 2014). Similarly, a study in Great Britain uncovered strong selection effects; specifically, the study found that compared to their middle-class counterparts, women from working-class backgrounds are more likely to have non-marital children, and they are less likely to be employed or to repartner (Rowlingson and McKay 2005). In sum, previous research indicates that both selection effects and the effects of the individual woman’s socioeconomic background and partnership status influence her subjective well-being. However, more longitudinal studies will be needed to disentangle the role of these effects and the mechanisms involved. How do social relationships, social networks, and social support affect lone parents’ well-being? Support research has shown that compared to coupled parents, lone parents receive less support and are more likely to report a lack in support (Targosz et al. 2003). However, single parents strongly rely on social support (Balaji et al. 2007; Harknett 2006), as having support enables them to combine family and work (Cook 2012; Ciabattari 2007). Having social support has been shown to be associated with enhanced economic well-being (Henly et al. 2005), while having access to child care and having emotional support has been found to be positively linked to the quality of mother-child interactions (Belle et al. 1981). By contrast, having low levels of support has been shown to be associated with depressive symptoms and low self-efficacy (Harknett 2006). A strong degree of reliance on support has been found among low-income single mothers in particular, and receiving support has both positive and negative consequences (Barnes 2003). Support from friends seems to be especially important (Coletta 1979; Tietjen 1985), but not all women have access to friends (Balaji et al. 2006). Support research has mainly focused on the positive effects of social relations, while the negative effects of social support (Attree 2005; Gräbe 1991) and the effects of negative ties and conflictual relations (Acock and Hurlbert 1990; Laireiter et al. 2007) are rarely discussed. The network perspective promises to provide a more comprehensive view of social relations, integrating the different kinds of ties, the different mechanisms through which social relations affect individual behavior, and the network structure. However, the literature on single parents from a network perspective is sparse. Most of the few existing studies were conducted in the U.S. and focused on women who are divorced (Albeck and Kaydar 2002; Duffy 1993; Leslie and Grady 1985; Nelson 1995), rather than never married. The research conducted in the U.S. on the social networks of individuals with different marital statuses has shown that the networks of individuals differ considerably depending on whether they are divorced, never married, or widowed (Hurlbert and Acock 1990). Little is known about how the networks of single parents living in Germany today differ depending on their paths into lone parenthood. One exception is a study by Nestmann and Stiehler (1998) on parents in Saxony (an eastern German federal state in which the share of mothers who are never married is relatively high), which found that never married mothers differ from divorced mothers in terms of network composition and access to support. We therefore assume that the results from research on divorced women in the U.S. cannot be fully applied to Germany, where over one-third of lone parents have never been married, 42% are divorced, 17% are not formally divorced but live in separate households, and 6% are widowed (Statistisches Bundesamt 2010: 11). We also have to keep in mind the welfare system and the prevailing norms and values regarding lone parenthood and giving/receiving support differ by region. For example, in contrast to the findings from the U.S., the results of a study from Sweden found that lone mothers receive more support than married mothers, and that the networks of married and unmarried mothers are very similar (Tietjen 1985). Studies that focus explicitly on the interplay of social networks and social support for lone mothers, and their effects on personal well-being, are rare. Particularly interesting are the studies by McLanahan et al. (1981) on divorced mothers in the U.S. and by Niepel (1996) on lone mothers in Germany. Despite their different samples, the two studies can be compared because they both focused on network structure and composition, collected network data in a similar manner, and developed a network typology.1 Based on their interviews with 45 divorced mothers in the U.S. (all of whom were white and almost all of whom were employed), McLanahan, Wedemeyer, and Adelberg (1981) identified three types of networks that emerged following divorce: (1) the woman reunited with her family of origin, (2) the woman built an extended network, or (3) the woman maintained or reestablished a conjugal relationship with the ex-partner or a new partner. The first type of network was dominated by members of the woman’s family of origin, included few friends, and was relatively small and dense. The second type of network included various groups of ties, was relatively large, was composed of several cliques, and included a large share of lone parents. In the third type of network, the new partnership dominated, and included the partner’s relatives. This type of network could be either small and dense with many old friends, or large and sparse with many friends. All three types were found to foster individual well-being if they fit the mother’s role orientation (aiming for stability in the first and third type, or aiming for change in the second type). In Germany, Niepel (1994) explored the social networks of 20 lone mothers (most of whom were employed) in the city of Bielefeld. She identified three network types based on their composition of family and friends: (1) friendship networks that were composed mainly of friends, included no relatives, and were relatively small and sparse; (2) family and friendship networks that were composed of friends and relatives, were relatively large, and included many relationships of long duration that were either loose or dense; and (3) family networks that were composed mainly of members of the woman’s family of origin, and were relatively small and dense. Niepel did not discuss how each type affects well-being, but observed that heterogeneous networks of medium size appear to provide the best conditions for coping with lone parenthood. If we compare the network types of Niepel with those of McLanahan, Wedemeer, and Adelberg (1981), we can see that both typologies focused on whether a given network is composed mainly of friendship ties or of family ties. The network typologies have a few similarities and large differences. Niepel’s family and friendship networks are similar to extended networks, but they are not necessarily large, nor do they contain a high share of lone parents. Niepel’s family network resembles the “reunited with the family of origin” type, but she found only one woman who had this type of network. Moreover, Niepel’s friendship networks do not resemble any of the types identified by McLanahan, Wedemeer, and Adelberg. On the other hand, she did not find the conjugal form in her data. These discrepancies could be attributable to cultural differences between the U.S. and Germany, historical differences between 1984 and 1996 (increasing individualization and the loosening of traditional family ties), or differences in the sample (only divorced mothers versus all kinds of lone mothers). Our study is in turn very different from these previous two studies in terms of the sample (all unemployed), the location (eastern Germany), and the time frame (conducted almost 20 years after Niepel’s study). We therefore cannot expect to find similar types, but we will also focus on network composition. In addition, based on our theoretical reflections we are also interested in including stressful relationships in order to capture the negative as well as the positive effects of social contacts on well-being. Our analysis presented here focuses mainly on three research questions: (1) What is the structure and the composition of unemployed lone parents’ networks? (2) Can we distinguish between different types of networks? And, (3) do these network types contribute to well-being in different ways, or do they detract from well-being? Given the explorative nature of the research questions, this research uses a concurrent mixed-methods approach that allows us to link network structures with the narrations of processes and the related meanings (Onwuegbuzie and Collins 2007). We combined problem-centered interviews with a structured collection of social network data on the same set of respondents. The sampling strategy has to balance the breadth and depth of the research interest. Aiming at an extensive collection of detailed insights into the respondents’ living situation and their social relations, asks for a small sample. Our sample therefore does not aim at representativity, but rather was designed to analyze in-depth the diversity of a certain population group that can be described as vulnerable. We purposively chose a group of persons, which is homogenous in being lone mothers, unemployed, and enrolled in public programs for unemployed parents in the federal state of Mecklenburg-Western Pomerania, Germany. Within this group, we aimed at a maximal variation, including persons with different age, number of children, children’s age, duration of unemployment, duration of lone motherhood, urban or rural living situation. We realized 26 interviews. They took place from July to September 2013, and lasted between 1 and 5 h.
The problem-centered interviews included narrative incentives designed to elicit rich and detailed accounts from the respondents, and prepared questions that cover a range of topics strongly focused on our research interest (Witzel and Reiter 2012). Each interview started with an initial narration, induced by asking the respondent to explain what her life was like when her first child was born, and how her life developed from that point onward. The specific topics touched upon later on included: experiences with family life, work experiences, dealing with unemployment, balancing work and family, and future aims and social relations. Collecting retrospective narrations allows us to examine at least partially the subjective causality link between lone motherhood, social relations, and well-being. The emotional elements of the concept of well-being were covered by asking the respondent about her feelings regarding, for example, being a lone mother or being unemployed; while the cognitive elements were covered by asking the respondent to evaluate her life satisfaction in general and in specific domains. The retrospective interviews cover past and present experiences, and conclude with questions about the respondent’s expectations for the future. Toward the end of the problem-centered interview network data was collected with the help of VennMaker software. This tool allows for a structured collection of network data, but because it was introduced at the end of the interviews, respondents continued to talk and provide more detail about their social relations while interacting with it. The name generating questions asked the respondents to identify the individuals who provide them with emotional support (talking about personal matters), childcare support, and support in finding a new job; as well as the individuals with whom they socialize (meeting up, going out, eating together, exercising, etc.). The program also asked the respondents to identify the individuals to whom they provide support, and with whom they have conflicts. The respondents could then place the generated names into a map of concentric circles (similar to those used by Kahn and Antonucci 1980 and in our research on family networks, see Keim 2011). The characteristics of the reported individuals were then collected (e.g., gender, age, employment status, family status, and relationship to ego), as well as the contacts between the alters (“know each other well,” “know each other less well,” “don’t know each other”). The qualitative accounts were recorded, transcribed, and analyzed using the qualitative content analysis method (Mayring 2000) by a team of researchers who identified the relevant themes and categorized the material based on how social relationships are perceived, activated, and generated; and whether they contributed to or detracted from the well-being of the unemployed lone parents and their children. Well-Being was coded according to its emotional and cognitive aspects: e.g., feelings about unemployment and lone parenthood, contentment with the family situation, and future expectations regarding family life and career. The network data were analyzed by means of social network analysis. We focused on network size (the number of network partners), network density (calculating the actual ties between alters over all of the possible ties among alters), and the multiplexity of ties (being named from one or several name generating question), as they can be interpreted as measures of the degree of social isolation or involvement. We also analyzed network composition in terms of role relations and other alteri characteristics. We analyzed these measures separately for the network of support (built by the name generating questions 1–4). This analysis cumulated in the development of a typology of social network composition that—despite the small sample—generated four clearly distinguishable types. In a third step, the qualitative and quantitative analyses were brought together through comparisons of the narrations about well-being, support, and conflict with the networks structure and compositions condensed into four network types. The respondents were recruited from public programs for unemployed parents designed to help them stabilize their family life and prepare for vocational integration. We interviewed individuals from different urban and rural areas of Mecklenburg-Western Pomerania. The interviews took place in July to October 2013 at a location convenient for the respondent. Each interview took an average of 2 h.
Included in this analysis are 26 mothers who were living alone with their children. The mothers were aged 24 to 49 (mean: 33.3). Most of these women had one or two children, and in most cases their younger child was between the ages of one and 15. None of the women we interviewed was freshly separated; all had been living alone with their children for at least 1 year, and some had never lived with the father of their children. Almost half of the women were in a new partnership, but they were not sharing a household with their partner. All of the women had lower secondary education or upper secondary vocational education. About half of them had never been in stable employment since finishing school or job training. Some of the women had been unemployed for more than 20 years, while four women had been unemployed for less than 2 years. We have identified five main themes related to well-being that recurred in the interviews: (1) general life satisfaction, (2) family life, (3) unemployment, (4) financial situation, and (5) social relations. General life satisfaction: Most of the respondents reported being satisfied with their life in general. However, many of them described having experienced severe strains (e.g., chronic or acute diseases, disabilities of the respondent or her children, exposure to violence, or large debts) or an accumulation of strains. Having experienced strains was not automatically associated with reduced overall well-being; rather, the extent to which the overall well-being of a respondent was negatively affected by these challenges depended on how she perceived them and was able to cope with them. In turn, the respondents who reported having low levels of life satisfaction were not necessarily those who suffered from multiple or especially severe strains. Family life: The reports regarding the emotional and cognitive components of the family life domain varied widely: some respondents said they had positive feelings (harmonic, joyful) and felt content; while others reported that they were extremely stressed and overextended, were in conflict with their children, or, in two extreme cases, were unable to establish a daily routine suitable for children. The respondents also dealt with their separation from their partner very differently: some women reported that they suffered emotionally and that the separation had been stressful, resulting in a negative self-perception and low self-esteem; while many of the women said they had a positive view of the separation because the partnership had been difficult and conflict-ridden. Some of the respondents had never lived with the child’s father, while others reported that despite having lived with a partner they had always been organizing everyday life with their children by themselves. While some did not have any contact to their former partner, others were currently struggling to reach an agreement with the father on child custody and visitation, and still others had already reached a satisfying arrangement. Unemployment: None of the respondents reported having positive feelings about being unemployed. The women all said that not having a job was a source of stress that had negatively affected their self-perception and self-esteem. They reported numerous experiences of having applied for a job and not getting it, or of failing in a job because they were not able to combine family and job. While some of the women said they would continue to seek employment, others reacted with resignation, and indicated that they had little confidence that they would ever be able to find a job. Some of the respondents appeared to take their labor market situation rather personally, claiming that their skill levels or lack of experience rendered them incapable of getting even the simplest job: “It didn’t even suffice for sorting spoons and knives.” The respondents identified three main sources of stress: a lack of money, a lack of social approval, and an abundance of time and boredom. A few of the women said they had developed a mania for cleanliness, cleaning their apartment several hours every day. The respondents’ approaches to dealing with their abundance of time were very different: some said they had become resigned and spent their time watching TV or on the internet, others reported putting all their energy and time into finding a new job, and still others said they had tried to establish an alternative to being integrated into paid work, such as volunteering in community activities or finding satisfaction in gardening. When asked about their perceptions of their options for future employment, the women varied strongly in their responses, from expressing feelings of resignation to feelings of optimism. The extent of their optimism was often connected to the degree to which they believe they would be able to combine work and family. Many of the respondents said that the only jobs available to them were those that would require them to work evenings, nights, or weekends, but they had no one to care for their children at these times: “I go in circles for years.” In contrast, the respondents who said they believe they could rely on their network partners to provide child care were more optimistic about being able to combine family and work. Financial situation: While some respondents stated proudly that they were managing well with their monthly budget, others said they felt that it was very difficult to live on the small amount of money they had available. The latter group consisted mainly of mothers of teenaged children, who said they found it difficult to meet the needs of their children (e.g., clothes, school trips), and experienced conflicts with them. Social relations: While all of the respondents indicated that they had at least two supportive network partners, the extent to which they described the support they received as adequate varied greatly. Many of the respondents also reported having conflictual relations, mainly with their former partners, their parents, their siblings, or their children. In some cases, these conflicts had been very durable and severe, resulting in a partial or full breakdown of the relationship. In other cases, the relationship had been maintained despite the conflicts, mainly in order to ensure that the children continued to have access to their father; or the relationship could not be fully broken because the conflictual tie was connected to other close network partners. Some of the conflictual relations reported involved broken friendships: a number of the respondents recounted that these “false friends” had disappointed them, misused their trust, or exploited their helpfulness. But having broken off these friendships, many of these respondents reported that they did not have any friends, and sometimes said they were not interested in finding any new friends. In sum, these accounts suggest that the well-being of the respondents varied greatly. The continuum ranged from (a) those who reported that they had stable self-esteem, a harmonious family life, few conflicts with family and friends, the ability to manage well within their financial budget, confidence that they would be able to combine family and work, and optimism about finding a job in the near future, even though their current lack of employment was a source of stress; to (b) those who reported that they had low self-esteem, were burdened by multiple challenges, had a stressful family situation, were engaged in conflictual relationships, were struggling financially, and were resigned to the possibility that they would never be able to find an adequate job. Belonging to a vulnerable group is not automatically associated with having a low level of well-being; rather, it is a matter of how the individual balances her resources and her challenges. It may be assumed that well-being is related to education, duration of unemployment, and duration of separation. In these respects our respondents were very homogenous: they had similar educational levels (secondary education with or without a professional degree), and they had been unemployed and separated for more than 1 year. Interestingly, some of the respondents who had a professional degree reported experiencing severe strains and a low level of well-being, while some of the respondents who lacked a professional degree reported having a relatively high level of well-being. However, some of the biographical narrations reveal that the respondents found themselves in a vicious circle: most of those who left school early or broke off their job training had grown up in a very difficult family situation, had accumulated multiple strains over the years, and were currently in a difficult family situation. In terms of unemployment duration, the interviews indicate that a long duration of unemployment often coincided with multiple strains and a low level of well-being, with some of these challenges having been acquired independently of the employment situation, and others arising as a consequence of unemployment. The respondents also varied considerably in their perceptions of their separation from their partner: some described the separation as very painful and stressful, while others said it was the best decision they ever made. Some of the mothers found it difficult to specify a date of separation because it had been a long process of drifting apart or of separating and getting back together. Regardless of the amount of time that had passed since the separation, some of the respondents said they felt their situation had stabilized quickly, while others said they were still finding their way as a lone parent even several years after the separation. In the following section, we will first look at the structural properties of the networks and present a typology, and will then focus on how the network types relate to well-being. On average, the support networks consisted of six individuals. The smallest network contained only two supportive ties, while the largest network contained 16 supportive ties. The network density ranged from very sparse (0.17) to very dense, with all of the network partners knowing each other. On average, 2.73 of the supportive ties were multiplex, ranging from zero to six ties. The respondents reported providing support to zero to 11 persons (mean of 2.45). While some of these exchanges were reciprocal, many were not. The number of conflictual relations ranged from zero to four, with an average of one conflictual relation. This shows that the social networks of this specific group of unemployed lone mothers are very heterogeneous, displaying a broad variety of structural characteristics, while social isolation seems to be rare. The support networks were composed mainly of relatives, friends, and institutional helpers. Eleven of the respondents included their current partner, while the children’s fathers wer included only by four respondents. Other sources of support cited were acquaintances and the (ex-) partner’s relatives (see Fig. 6.1). Eight respondents did not include any relatives, while six respondents did not include any friends. The conflictual ties were mainly the respondents’ own relatives (22% were sisters, 13% were brothers, 13% were mothers), their ex-partners (17%) and their ex-partners’ relatives (13%). Friends, current partners, and neighbors were cited less frequently as conflictual ties. We developed a network typology according to the networks’ composition, looking at the type of ties that dominate the network. We found the respondents to be engaged in four different types of networks: (1) a network dominated by the family of origin, (2) a network centered on a conjugal relationship, (3) an extended network dominated by friends, or (4) a restricted network, which is very small and/or dominated by institutional helpers (see Table 6.1). We will describe the four types briefly in this section before giving more detailed examples of how they are related to well-being in the mixed-methods analysis in the following section. In the networks dominated by the family of origin, relatives made up an average of 58% of the ties, with shares ranging from 40% to 80%. These networks were, on average, of medium size and high density, but their sizes and densities varied considerably (size: from four to 10; density: from 0.17 to 1). On average, 3.5 of the ties in the support networks were multiplex, ranging from one to four. These networks included 1.3 conflictual ties on average, and help was being provided to four ties on average. In the second type of network, centered on a conjugal relationship, an average of 48% of the ties were to either the ex-partner or the new partner and his relatives, with shares ranging from 40% to 60%. In one case, both the ex-partner and the new partner were included. These networks were rather small on average, including just four or five supportive ties. Some were very dense (density of one), while others were extremely sparse (density of 0.17). The support network contained an average of three multiplex ties. The number of conflictual ties was comparatively high, and the number of ties to whom help was being provided was rather low. The third type of network, the extended network, included a relatively high share of friends (on average 49%). These networks were very large, with a medium density. Many ties were multiplex, and only a few were conflictual. The number of individuals to whom help was being provided was very high. Two subgroups could be distinguished, (1) friendship-dominated networks of medium size, and (2) very large heterogeneous networks containing friends, relatives, and new or old partners and their relatives. The fourth type is called a restricted network because these networks were small and sparse, and the support they provided was rather limited. Multiplexity was low, as was the number of ties to whom help was being provided. These networks had slightly more than the average number of conflictual ties. What is particularly interesting about these networks is that in most of them the share of network partners who were institutionalized helpers was very high (on average 41%). These helpers were mainly from the Youth Welfare Office or the Federal Employment Office, or they were social workers, family helpers, or mentors from job integration programs. Figure 6.2 displays a typical example for the network structure of each type. The network charts display the network partners, as well as their relationships to each other. A circle represents a woman, a triangle represents a man, while a square represents an institution or an institutional helper. A line indicates that the network partners know each other. All names have been anonymized and are fictious. We are aware that a woman’s experience of lone parenthood and unemployment is related to her education, her employment experiences, the duration of her lone parenthood, the ages of her children, and her relationship with the father of her children. In our study, were these factors related to the type of network each woman was involved in? We would expect to find that women with higher levels of education, more job experience, older children, and a longer duration of lone parenthood would be more socially engaged because they had more opportunities to make contacts, more free time, and more time to adapt to lone parenthood and establish new contacts. When we look at the extended and the restricted network types, a clear picture emerges: extended networks were more common among respondents with upper secondary education and job experience, while restricted networks were more common among respondents with lower secondary education and long periods of unemployment. However, the ages of the children did not play the role we presumed: many of the respondents with pre-school children had an extended network. The characteristics of the respondents with the two other network types were rather mixed. To sum up our findings on the respondents’ networks, we can see that persons embedded in family-of-origin dominated and extended networks profit from a comparably large number of supporters, the contacts are often multiplex and the support is reciprocal. We therefore would assume that these network types coincide with high levels of well-being. Conjugal and restricted networks are rather small and therefore may not foster personal well-being as much. Additionally, the restricted networks often lack multiplex ties and include conflictual ties, which may result in a limited well-being. Our next analysis combines network and narrative data, in order to find out, if these assumptions hold and how certain network structures relate to personal well-being. How Is Well-Being Related to the Network Types and Characteristics? In our mixed-methods analysis, we confronted each respondents’ network structure with her narration during the interview and analyzed how well-being and social relations are related. In this section, we present for each network type a) a case study that shows what resources the respondent had available, and how the respondent coped with critical events and chronic stresses and b) our general findings on the well-being of respondents embedded in this type of network. The case studies presented here correspond to the networks displayed in Fig. 6.2. Susi Müller is a 33-year-old mother of three children (aged 10, 11, and 14). She has lower secondary education, was not trained in a job, and has never worked. Her husband was an alcoholic and the marriage was difficult. After the death of her husband 6 years ago, she moved back to the city her family lives in. She is currently involved in a new partnership. Her oldest child lives in a youth home. When she is asked why, she says that he refused to go to school and often got drunk. The respondents embedded in networks dominated by the family of origin typically express high levels of well-being, also despite experiencing certain challenges (e.g., children in institutional care, financial problems, or diseases or disabilities of their own or of a close tie). Most of these respondents, such as Susi Müller, reported that they were handling these strains well with the support of their family, and expressed a relatively high level of life satisfaction. A few said the support available from their family was not sufficient, either because their family members were too poor to provide adequate financial aid, or were too sick to provide adequate instrumental support. These respondents said they perceived their everyday life as stressful, and found combining family and work difficult or even impossible. From this we infer that being embedded in a network with family members does not automatically coincide with well-being, but fosters well-being only if these family members are able to provide adequate support. The most supportive person among the relatives is typically the mother, but siblings could also take this position. Interestingly, some of the respondents did not really return to their family of origin after separating from their partner, as they had never truly left home. For example, in some cases the woman had her first child at a young age, separated from her partner soon after conception, and had relied on her family for help with raising her oldest child ever since. Sabrina Meier is a 28-year-old mother of three children (aged five, seven, and nine). She holds a lower secondary degree, has not finished her job training, and has no work experience. This month she starts working in a mini-job. She separated from the children’s father two years ago, and found the separation extremely difficult and stressful. She moved with her children to another city and argued with the children’s father about custody. During this period, the younger children were living with foster parents. One year ago, the situation was stabilized and settled by the court: the youngest child lives with the father and the two older girls live with her. She has also had a new boyfriend for the past year and a half. Like all of the respondents who were embedded in conjugal networks, Sabrina reported having a high level of well-being, despite also having various problems. Although these respondents said they perceived their joblessness as stressful, they also reported that they were largely content with their family life, and that the support they received from their partner and their partner’s family offset their stresses and strains. Only in case the conjugal family members were unable to provide adequate support e.g. due to chronic/severe diseases, these networks did not foster well-being as much. Persons embedded in this type of network have reduced or broken contact to their family of origin, mostly because the relationships had been very conflictual in the past. The respondents have compensated this loss by engaging into contacts with their partner’s family. The conjugal networks show that the partner’s family can be as supportive as the family of origin. Regarding the size, a medium size seems to be enough to foster well-being, and characteristics as multiplexity seem to be more important than the size. However, as we noted above, the mere existence of supportive conjugal family members is not necessarily an indicator of the availability of support adequate and sufficient in order to foster well-being. Doreen Schulz is a 35-year-old mother of a five-year-old child. She holds an upper secondary vocational degree and has work experience, but not in the job she was trained in. She has been unemployed for 2 years. She did not experience the separation from the child’s father as a sudden or significant break, and therefore cannot really give a date of separation. Instead, she says, the process of separation started with the arrival of the child (which was planned), as the child’s father has never really built a relationship to his child nor participated in family life. She was therefore used to organizing her life on her own for a long time before he finally moved out. Today she has a good relationship with her child’s father. She describes herself as content with her general life situation. In terms of the life domains, she expresses positive feelings and a high level of satisfaction with her family life and does not report any strains associated with being a single mother. She feels supported by her family (her parents and her cousin help her take care of the child), and reports that her mother has taken over much of the function of the child’s father: “For my daughter the second attachment figure is not daddy, but grandma.” She can fully rely on her mother’s support, and they are in close and frequent contact. For example, her daughter calls her grandparents every evening to wish them a good night. She has many friends, some of whom are old school mates, and some of whom are mothers of her child’s friends. She is not satisfied with her lack of a job: “It’s a little frustrating, that one keeps applying for jobs and only gets letters of refusal or no answer at all.” She is frustrated about being home during the day while her friends are all working. In this situation as well she feels supported by her family and friends, who tell her about open positions. Her mother has offered to help her with child care if she returns to full-time work. She is optimistic about her prospects of finding a new job, and expects to be able to combine family and work with the help of her mother. In sum, she does not perceive lone motherhood as stressful, and she does not report any major strains or stresses apart from being unemployed. She describes her social network as supportive, providing emotional, instrumental, and informational support, as well as social companionship. She does not have any conflictual ties. Doreen Schulz was typical for all cases in this category: they had upper secondary vocational degrees, job experience, a relatively high level of general life satisfaction, relatively few strains and stresses, and a variety of supportive relations they could rely on. These women either never had or were largely able to free themselves from conflictual ties by ending their relationship, which positively affected their well-being. They reported that friends were helping them manage family strains by providing emotional closeness, sociability, and various forms of support, but offered only limited support in terms of child care. In case their extended networks were made up entirely of friends and did not include any family members, these networks did not provide adequate child care support –as this kind of support is most helpful when it is provided regularly, flexibly, and without asking for too much help in return. Although the respondents who were embedded in friendship-dominated networks were generally optimistic about finding a new job, they also said they perceived combining family and work as very difficult and stressful. From this we infer that family members play a crucial role in child care support, and cannot easily be replaced by friends. Mareike Lehr is a 26-year-old mother of a six-year-old child. She holds an upper secondary vocational degree, and has been unemployed since she finished her job training. She separated from her child’s father 5 years ago, and has had three relationships since then. Two years ago, after a relationship of 18 months ended, she fell into a depression. She is currently in the process of starting a new relationship. She expresses very limited life satisfaction. Her biographical narrations reveal various strains: a difficult relationship with her mother and grandmother, violence in a former partnership, depression, difficulties in caring adequately for her child, and debts. She loves her child, but she is also happy when she can leave him with her grandmother, even though the relationship with her grandmother is also sometimes conflictual. Regarding family life, she is grateful for the support of two institutional helpers. Although she is aware that it is their job to help her, she states that she has “the feeling, this is like a good friend.” Asked about friends, she states that she does not have any, only some “pals”, that is mainly contacts via the internet. She does not perceive her lack of employment as stressful, but her financial situation leaves her with little means to pursue free time activities. She has few expectations for the future; her planning horizon extends only over the next few weeks and months. For example, because the period during which she receives institutional help is running out she is thinking about letting her household become a mess again so that the assistance is extended. Her network contains her grandmother, her mother, and her new boyfriend, as well as four institutional supporters who help her with her family and with finding a job. Most of the respondents with restricted networks reported having severe and multiple strains. They indicated that they had low levels of well-being in terms of their everyday family life and their employment situation. They reported having low self-esteem, financial problems, and/or conflictual relationships. When asked about their networks, they cited few private contacts, and often could not name any close friends. The strains they were experiencing appear to have hampered them in engaging in social relationships. For example, having to spend large amounts of time caring for a disabled child or being severely depressed restricted their ability to engage in reciprocal relationships. The existing network partners of these women were not able to provide adequate support, either because the amount of support needed was extremely large, or because the supporters had little time, money, or strength themselves; their positive impact on well-being was therefore very limited. In some of these networks, institutional helpers stepped in and took over supportive functions. While some of these networks were of women in a state of transition (they had just moved and had dissociated themselves from their former network partners, but had not yet been able to build new contacts), others were networks of women who were under extreme pressure for a long time, and who had little access to social resources. Research on lone mothers has long taken a deficit perspective, mainly looking at what single mothers are missing, and describing them as facing a high risk of social isolation. However, newer research has stressed the agency of lone mothers in coping with their life situations, and reveals a more differentiated picture. These studies have applied a network perspective and have thus looked in detail at the personal relations lone mothers are engaged in, as well as at the structural characteristics of the networks they form. They have found that lone mothers have a high level of social integration and access to support. However, many of these studies focused on employed women. What would we find if we looked at unemployed lone mothers? Is the hypothesis that single mothers are socially isolated more applicable to this group because they are neither integrated into a family-in-law nor into employment, have to deal with raising their children and finding a job on their own, and are at high risk of poverty? Moreover, would the stressful life situations of these lone mothers lead them to have looser contacts, or to have relationships with people who are in a similarly strained situation, and are therefore unable to provide much support? Alternatively, would these lone mothers need more support than their network partners could provide? Interestingly, our findings indicate that the hypothesis of social isolation does not hold for this group either, and that the picture is much more differentiated. The social networks of our respondents ranged from being very small to being very large, and the amount of support they reported receiving ranged from being very little to a lot, and from insufficient to adequate. All of the respondents said they received some form of support. To better capture the variety of networks available we developed a typology in which we distinguished between four network types according to the network composition: networks dominated by the family of origin, networks centered on a conjugal relationship, extended networks, and restricted networks. The first type, or networks dominated by the family of origin, were similar to the “return to family of origin” type described by McLanahan, Wedemeer, and Adelberg (1981) and the “family network” type presented by Niepel (1994). Our type was, however, structurally different from these types because the networks’ sizes and densities varied considerably, and were not all very small and very dense. While McLanahan, Wedemeer, and Adelberg (1981) described their respondents as being in a “family haven,” and having little contact to peers or engaging in social activities outside the family, most of our respondents had friends, and their networks were not necessarily small or dense. However, unlike in the extended networks, in the networks dominated by the family of origin family members provided most of the support. The networks centered on conjugal relationships (dominated by the (ex-) partner’s relatives) were similar in composition to the corresponding networks described by McLanahan, Wedemeer, and Adelberg (1981). The structure was somewhat similar, as many of these networks were rather small, sparse, and dense. The extended networks we described were similar in composition and structure (large in size, and composed of various groups, such as relatives, friends, and the partner’s relatives) to the extended networks found by McLanahan, Wedemeer, and Adelberg (1981) and the family and friendship networks identified by Niepel (1994). Our restricted networks did not match any of the network types identified by McLanahan et al. (1981) or by Niepel (1994). This network type was found mainly among mothers who were experiencing severe strains or multiple problems, and were therefore highly vulnerable. These networks were mostly small and sparse, like the friendship networks described by Niepel; but they included relatives and hardly any friends. The women who had these networks were socially isolated in terms of their private contacts, but institutional helpers who served as emotionally and instrumentally supportive ties sometimes filled this gap. The fact that these respondents had a large number of institutionalized helpers could be due to our sampling strategy, as we recruited women who were enrolled in a program for labor market re-integration. However, many of the institutional helpers mentioned were employees not only of these programs, but of institutions dedicated to helping people stabilize their family life. This institutional support can play a pivotal role for women embedded in restricted networks, as it can provide these women with a minimum level of support, help them stabilize their living situation, and get their life back under control after a series of setbacks. Returning to our question of whether lone mothers are lonely, we can state that even within the vulnerable group of unemployed lone mothers, all of the women were somewhat socially integrated and received some form of support; thus, they were not fully isolated, but those embedded in restricted networks had a very limited social safety net. Although the women who were embedded in the other three network types had various contacts, some reported that the support they were receiving from their network partners was insufficient, often because the network partners’ resources were limited or their needs were very large. Our respondents, who were recruited from an employment program, were willing and able to participate, to accept help, and to be interviewed. It is likely that there are more socially isolated lone mothers who cannot or do not want to attend to such a program, and who would not consent to being interviewed. We know little about the support these highly vulnerable people receive, or about their coping strategies. In our study, which was conducted more than 30 years later and on respondents from eastern Germany, these role relations did not apply. To most eastern German mothers combining work with family is a given. We thus found that the inclination to work was extremely high: even among our sample of long-term unemployed mothers who had often failed in finding or keeping a job, only a few had resigned themselves to being unemployed. Our findings suggest that different network types were associated with differences in well-being. At the top of the scale were extended networks, which were highly supportive, and were found among women who said they felt content with their family life and were optimistic that they would soon find a job. At the lowest end of the scale were restricted networks, which did not offer adequate support and were found among women who said they felt stressed in their family life, and that they had resigned themselves to being unable to find a job. The association between network structure and well-being was bidirectional: (1) the network type was a consequence of the strains the respondents were experiencing, and (2) the extent to which social networks were able to foster well-being depended on their structure and composition, the resources the network partners were able and willing to supply and how the respondents evaluated the support. If we look at this bidirectional influence by comparing the two types of networks that were the most different—i.e., extended and restricted—we can see that the women who had low levels of well-being and were experiencing severe strains were not able to invest in their network, to form new relationships, or to provide help in return for the support they received. Thus, their contacts mostly provided one type of support, the multiplexity of their contacts was low, and their networks were restricted. The support provided in these restricted networks was often insufficient, and the social relations did little to improve the women’s well-being. Many of these women had biographical strains, such as a difficult childhood, that had long-term negative effects on their well-being as an adult, and led them to cut ties with their own relatives. In contrast, respondents who were embedded in extended networks reported having a relatively high level of well-being and a greater willingness and ability to make new contacts and to invest in their relationships, by, for example, providing help to their network partners. Their many network partners provided them with various forms of support in return. Because their ties were often multiplex, they could generally rely on a range of network partners to provide them with support, which helped to relieve their stress and fostered a high level of well-being. This appears to be an example of the Matthew effect: having a high level of well-being leads a person to form supportive networks, which in turn fosters the person’s well-being. This effect can also work in the other direction: having a low level of well-being leads a person to have a limited network of partners who cannot provide the person with adequate support to foster her well-being. This can become a vicious circle that is unlikely to be broken without the intervention of a third party, e.g. social workers. From a structural point of view, the question of whether supportive networks have certain structural features arises. In terms of composition, we found in our sample that extended networks that were of medium or large size and of medium density, and that contained heterogeneous network members (mainly the woman’s own relatives, her partner’s relatives, and her friends), a large number of multiplex ties, and many reciprocal relations were the most supportive. We also found that family-dominated networks and networks centered on conjugal relationships (of small or medium size, of high density, with medium multiplexity and low or high levels of reciprocity) provided adequate support, but that they were more vulnerable: if the woman experienced severe strains or the relative or partner was unable to provide support (e.g., in case of sickness), she often had few or no network partners who could assist or replace the supportive tie. Interestingly, we found that extended networks without any relatives who are supportive in childcare could not adequately help to combine family and job, which hampered well-being. This stresses the important and beneficial role of own or the partner’s relatives for regular and reliable support in childcare. Least supportive were the restricted networks, which were of small size, and multiplexity, and had few reciprocal ties. In our sample, we found that institutional helpers sometimes stepped in to shield respondents from social isolation, but that these helpers could not replace the emotional support and stability provided by personal private ties. To sum up, in terms of network structure, it is not density alone, as proposed by McLanahan, Wedemeer, and Adelberg (1981), that determines the supportive effect of unemployed lone mother’s networks. In our research, we found that the most supportive networks were of a large or a medium size, and included heterogeneous and multiplex ties (including the woman’s own or her partner’s relatives). Trying to identify the structural properties of the different network types does not provide a clear picture. While our findings are similar to those of previous studies in some respects, they also differ considerably from them in others. To learn more about typical networks and the correspondence between network types and their structural properties, future research should include additional network measures and involve a larger sample in order to explore in more detail how structural features and well-being are related. Our research shows that beyond the networks’ structural properties, also their meaning to the respondents had to be taken into account: only if the ties are not perceived as conflictual and if the support provided is evaluated as adequate, these ties can foster well-being. As the associations between structure, support, and well-being are rather complex, future research on these links is needed, which includes not only structural information but also the respondents’ subjective evaluation of their ties and the support available. Although we had retrospective data, our research was limited by its cross-sectional design. To better disentangle the causal relationship between social networks and well-being, we would need longitudinal data that cover changes in the partnership status as well as in the social network structure. Our retrospective narrations captured some of the changes, but could not fully represent the dynamics in network structures over time. Another limitation of our research is that we focused on a group of lone mothers who were long-term unemployed, even though in Mecklenburg-Western Pomerania the majority (65%) of lone mothers are engaged in paid work (Buch et al. 2012: 20). We chose to focus on this group because we assumed that doing so would provide us with the best chances of detecting vulnerability; an issue we wanted to analyze in depth. Future research should extend the analyses to the social networks of employed lone mothers, as well as (employed and unemployed) partnered mothers. Moreover, given the persisting differences between eastern and western Germany in terms of both the labor market and family relations, the view should be broadened to western Germany. As the existing literature on lone fathers is very limited, more research on their social networks and coping strategies should also be conducted in order to learn more about gender-specific differences in social networks and well-being. McLanahan et al. (1981) performed in-depth interviews in which they let the respondents write their supportive ties on small disks and arrange them on a piece of paper, drawing lines between those who knew and interacted with each other. They used probes to ensure that the respondents considered all three theoretically predefined areas of support. In contrast, Niepel (1994) used within a qualitative interview on lone parenthood a questionnaire that in a first step asked about the relevance of 17 different forms of support, and in a second step demanded that the respondents provide a list of supportive persons. Despite their different methods of collecting the data, they both applied a very broad network-generating question, and were trying to collect a “full range of network as well as support characteristics” (McLanahan et al. 1981: 603).